Thanks to Ken for passing on details of this one. (It was a pleasure to be able to tell Ken about The Bristol Maze yesterday rather than the other way round, but an increasingly rare pleasure…) It’s a little unusual. 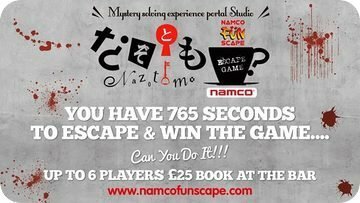 It turns out that there’s an exit game at the Namco Funscape at County Hall in London, on the bank of the Thames very near the London Eye, near Waterloo station. There’s not a great deal of information about it, but here’s what there is. “Fancy embarking on a thrilling, adrenalin-pumping challenge with your friends or colleagues in the heart of London? Our brand new Escape Room gives you and five friends or co-workers just 765 seconds to solve the puzzle, extricate yourselves from your shackles and escape! The Escape Room is designed for up to six players at one time, and costs just £25 for your group. To find out more or book an event, call our team on 020 7967 1066 or click the button below to request further information.” Or, indeed, you can book at the bar with no notice. There doesn’t seem to be any more specific way to book ahead. It’s very interesting that the site does not consider the exit game a sufficient attraction to promote it further; as Ken put it, it’s now at the level of an impulse purchase – and the price point suggests that too. The time limit of 765 seconds (12¾ minutes, so the game will be something of a sprint, as you’d expect from a game that cheap) is rather unusual, but there’s something of a story behind it. You’ll see the number 765 get passing mentions in a few different Namco games – for instance, in high-score tables, or as bonus point scores. This is because there’s a sort of numbers-to-syllables Japanese wordplay that relies on the way that Japanese numbers can be read in a couple of different ways. Seven can be read as, roughly, nana, six as mutsu and five (by another, more familiar, scheme) as go. Taking parts of those readings, you get na-mu-go, which is close enough to Namco for jazz. (Hey, what’s the difference between stopped dorsal consonants between friends?) By comparison, Konami can be associated with the number 573 and so on. One other thing to note is English-language letters spelling nazotomo in the logo. http://nazotomo.com/ is a Japanese-language site. As far as Google Translate can suggest, this might be a site all about exit games in Japan, or one brand of exit games in Japan. This site can get no further; sites which have graphics of the Japanese characters, rather than textual representations, are rather trickier for automatic translators, at least until they merge OCR-like functionality in… Even trying to look for something on Japanese-language Wikipedia, which normally works quite well for online translators, draws a blank. This English-language review points to a site with ten such sprint exit games at a bargain basement price. Is this, along with the huge stadium events, the way that exit games are played in Japan these days? Is this the rather low-key future of exit games in the UK? Don’t know, but it might be at least part of the future, so is definitely one to watch. Good detailed research! I’m intrigued by your comment of a site with ten “sprint” gamees. Having played ThinkingBob’s licence to escape, I think there’s a market for that. Partly because I imagine they’re cheaper than putting together a whole escape room and so can be cycled more often, and partly because escape room companies must come up with a fair number of puzzles that never see the light of day and/or they want to play test. Sadly, a 12 minute game isn’t draw enough to get me to go and play, but I might make it along some time if I’m passing on the way to or from another game. That post in question comes highly recommended! Indeed, so does that whole blog, perhaps the one with most global appeal of your three (escape, escaped for games and events and escaping for conventional exit games). Whoops, thanks, updated; I linked here. Very interesting… more to come on this topic.